In 2008, “The missing memristor found”  was published in the respected science journal Nature, and this claimed discovery was announced on the front pages of most major newspapers. This “discovery” is simply a misinterpretation of devices that had been discovered many years before in India [2,3]. Those original inventors did not misinterpret their work in order to make it into the news. Given the serious doubts that have been presented in many places, one seriously wonders whether the fact that the cheated are ‘just a bunch of Indians in India’ has anything to do with the embarrassing situation of that most science media and bloggers do not care. This though cannot explain that criticism is effectively censored. One thorough and fatal criticism has found its way into a scientific journal: The technical part of “The Missing Memristor: Novel Nanotechnology or rather new Case Study for the Philosophy and Sociology of Science?”  has appeared as “Missing the Memristor” in Advanced Science Letters . The papers are already quoted in further critical articles such as Fundamental Issues and Problems in the Realization of Memristors*. The memristor has still not been found and may be impossible, but let us first see what this “memristor” is all about. The resistor, the capacitor, and the inductor are three well known, basic two-terminal circuit elements. In 1971, Leon Chua postulated a fourth, the “memristor” , on grounds of symmetry arguments, i.e. for the sake of completeness of circuit theory. The three well known ones correspond to extremely simple devices. Naively, the memristor issue could be added to success stories like Le Verrier’s prediction of the existence and location of Neptune in 1846 and Dirac’s prediction of the positron in 1928. Mendeleev’s prediction of undiscovered chemical elements in 1870 rested on the still empty cells in the periodic table of the elements. The memristor is similarly a vacant spot in a two dimensional table, though a much smaller one. The case is somewhat similar to Murray Gell-Mann noticing missing pieces in the patterns of SU(3) symmetry representations, which led him to successfully predict some subatomic particles. These historically predicted entities were discovered relatively soon after having been foretold. The eventual discovery of something that was naively expected to be as simple as a capacitor or inductor, which can be constructed from just two metal plates or a metal coil, respectively, with a delay of almost 40 years, is intriguing by itself. The long delay is perhaps a symptom of there being no such thing as a real memristor. The predicted memristor must (!) involve magnetic flux, but the discovered devices involve none. The following submits the memristor as a case for the sociology of science: Leon Chua did not reject the purported discovery in 2008, but instead, the otherwise almost forgotten man changed his mind about what the memristor device is! One wonders why, and particular suspicions are strengthened by the flood of papers that was generated under the catchy “memristor” label (as well as the number of patent applications that rest with certain, extremely competitive companies that can draw on large financial resources - the fake memristor is called "HP Memristor" for a reason!). The memristor discovery reminds of the purported detection of gravitational waves by Joseph Weber in the late 1960s, which after an initial acceptance was discredited in the mid 1970s. IBM physicist Richard Garwin built a similar detector but could only find one pulse in half a year, and that was noise. Some rebuttals reviewed Weber’s data analysis. The physicist David Douglass found an error in Weber's computer program which combined noise and artifices due to how the data was divided into batches which then resulted in daily coincidence signals. The most damaging rebuttals however were of a theoretical, even philosophical nature, similar to those that apply to the memristor. Garwin pointed out that if Weber's detections were real, the universe would convert all of its energy into gravitational radiation in only 50 million years (the universe is much older than that!). In both cases, the entity in question was predicted on theoretical grounds but may conceivably be impossible. At the time of the first claimed detection of gravitational waves in 1969, their measurability was doubted even by those comfortable with general relativity: Would not the measure tape contract exactly along with the space contraction due to gravity waves? 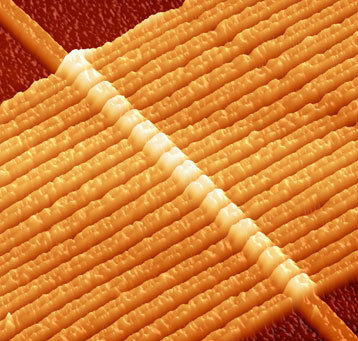 The originally proposed memristor may be impossible as a really existing device. Both times there are devices and real observations involved. As far as we know, Weber did not consciously make up any data; he reported what his visual system’s acute pattern-recognition told him (when confronted with noise in what is a naïve way of data analysis). Later, he reported what flawed computer software calculated. However, the cases are quite different. Gravitational waves have been inferred from astrophysical observations, but they still have not been detected. If you ask for a memristor, you may be given an actual device. That object sitting in your palm is certainly not a misinterpretation of noise by software. If that object is not a memristor, something other than engineering has gone astray. Physics itself refused Weber’s claims relatively fast. Particularly those differences that make the memristor issue interesting to sociology seem to ensure that science proper will not deliver speedily again without some outside prodding. Not just one Joseph Weber fears for his reputation, but a well funded scientific sub-field wants to believe into the memristor story. The memristor debacle needs to be brought to the attention of a wide audience. There must be a focused and solid argument on the grounds of which the case can be widely accepted as controversial. “The Missing Memristor” [4,5] does precisely this. A self contained introduction on what the purported discovery is and why it is questionable reduces technicalities* to the bare minimum. Memristance is carefully introduced and the discovered thin film devices are described in a selfcontained fashion. Explaining the memristor as a model of circuit theory and discussing its stability cast doubts on the necessity and viability of a memristor as an actual device. The real death sentence to the claimed memristors is spoken by a thought experiment that assumes a world without magnetic fields. The discovered devices would have been discovered there, too, but inductors would obviously not exist. Identifying the devices as memristors would predict a missing “inductor” on the same grounds as the memristor was historically predicted. And an “inductor” would be found although we know that real inductors in that world are impossible. The early attempts at an analysis in terms of the sociology of science points toward a deepening crisis that has repercussions for the public trust in science and important related issues, say global warming denial: The publish-or-perish crisis that has corrupted science via the evolved peer review mechanisms. “The device will operate for a certain time like a "chemical capacitor"”. Our criticism should not focus on such technicalities. The general argument is much more powerful and understandable to a wide audience.